Lycanthropic Empathy: In any form, lycanthropes can communicate and empathize with normal or dire animals of their animal form. This gives them a +1 racial bonus on checks when influencing the animal’s attitude and allows the communication of simple concepts and (if the animal is friendly) commands, such as "friend," "foe," "flee," and "attack." A lycanthrope retains all the special qualities of the base creature and the base animal, and also gains those described below. A lycanthrope can assume the form of a specific animal (as indicated in its entry). Changing to or from animal or hybrid form is a move action and a charisma check. As his companions fall around him, Wolfram Alpha, enraged by the onslaught of magical trickery, bursts into hybrid form. Firing two arrows at a time straight into the organs of orcs and white elves alike, he struggles to breathe through the acid gas that has destroyed the lungs of his companion, Caleb. 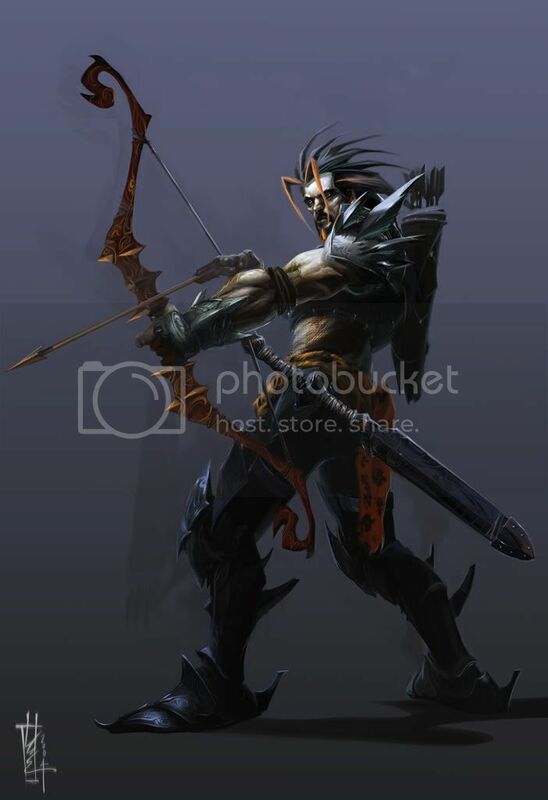 Seeing that the passageway is clear of the force walls that were rendering his projectlies useless, he stows his daemon bow and charges towards the mages, his Hunter's Blade in hand. Surrounded by magicians and their foul orc servants, Wolfram attacks as if every movement is his last. The white elves trap him in a cage of invisible walls and stand around him, laughing sadistically, waiting for their chance to strike. His mind overtaken by rage, Wolfram mentally fends off the incantations that promise to turn him to stone, and, feeling his strength waning, he begins to run, every fiber of his being hoping for a way out of this hell into which he has been thrust. An orc deftly knocks him to the ground and the mages advance, trapping him again in their invisible prison. Fear fills his soul as he realises the futility of his situation. As his concentration wavers and the mages begin chanting, his last thought is for his brother, Andreas, and he vows that they will be reunited as his body and mind turn, piece by piece, to stone.